Sand/Finish—Wood Floor Finishing: Your floor can be restored to its original beauty through wood floor refinishing. back to life, you can create a whole new look by staining it or changing the sheen of the finish. do a thorough job of clean up. for example carpet or linoleum, have been removed and existing hardwood floors have been repaired and refinished. Wood floors covered by these other products are a gem waiting to be discovered, quickly adding value to your home. Please see the before and after pictures and read the testimonials on our website. 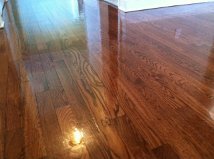 having their hardwood floors sanded or screened without the enormous amount of airborne dust!